The distinctive two-coloured patterned knitting which is widely known as ‘Sanquhar Knitting’ takes it’s name from the small and ancient burgh of Sanquhar in South West Scotland. 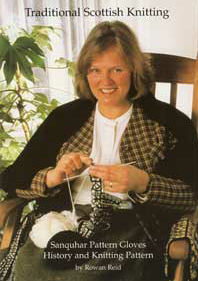 Scottish Muffatees designed by Alyne Jones, pattern leaflet published 2006. Traditionally the Initials of the wearer are knitted into the cuffs of Sanquhar Gloves. Jenny McMillan collected these patterns orally from Sanquhar Knitters in 1960’s and prepared these patterns for the Scottish Womens Rural Institute. Below you can listen to Jean talking about her early days at school in Sanquhar. She also knitted gloves for the Cornet, the principal in the Riding of the Marches.